Sanjay Garg and his company Raw Mango are creating a fashionable range of saris aimed at a younger generation. His design interventions focus on simplifying traditional motifs, using bold bright colours and experimenting with handloom weaving to make lighter more wearable saris. Sari, pink/orange chanderi, with orange boarder and green selvedge; the pallou has a motif of small crows woven in rows in pink with one in green; pink blouse with green detail on sleeve and pink petticoat. 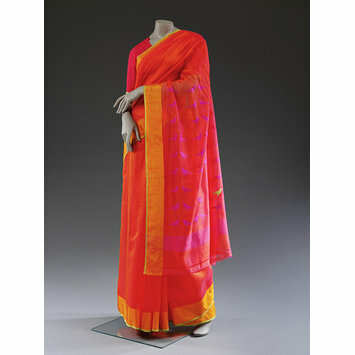 Raw Mango is at the forefront of making saris more fashionable to a younger generation. 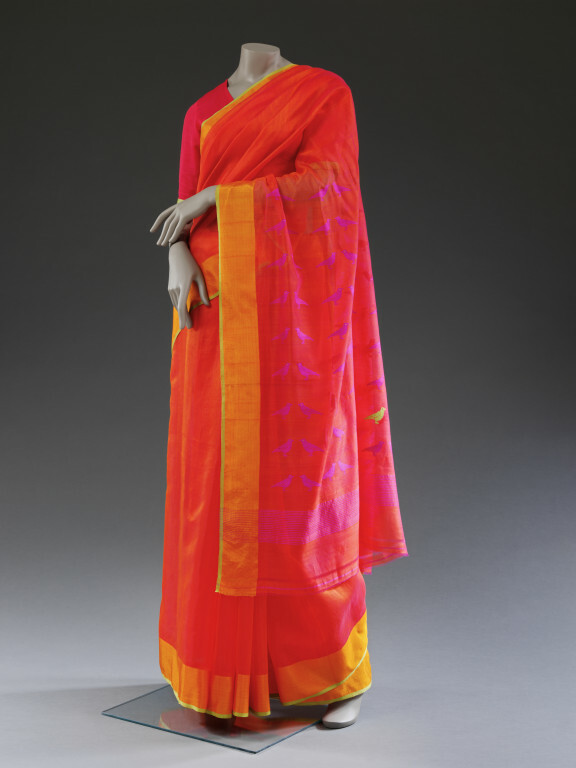 Designer Sanjay Garg simplifies traditional motifs, combining them with bright colours and a mix of silk and cotton thread to make lighter, more wearable saris. The pallu or end of the sari has 108 (an auspicious number in India) small crows in pink, with one woven in green.